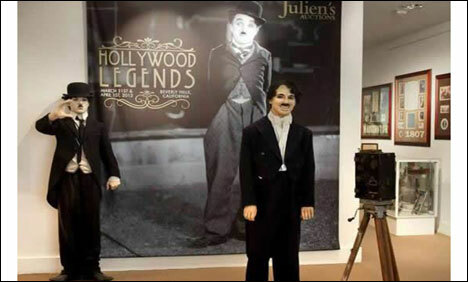 LOS ANGELES: A trademark bowler hat and cane once owned by Charlie Chaplin sold for $100,000 Sunday, at a Hollywood auction where Whitney Houston gowns and gems also went under the hammer weeks after she died. The bamboo walking cane once owned by the silent-era comedy icon went for $42,000 -- considerably more than the $20-30,000 reserve price -- while the trademark hat was snapped up for $58,000 on the second day of the two-day sale. A riding coat worn by Clark Gable in "Gone with the Wind" sold for $57,600, nearly four times its $10-15,000 reserve price, while Charlton Heston's robe from "The Ten Commandments" fetched $66,420, and his staff $44,800. On Saturday fans and collectors had snapped up a selection of gowns, stage clothes and jewelry belonging to Whitney Houston, weeks after the Grammy-winning star's shock death aged only 48. Prices reached more than five times their reserve on some items, including two pairs of earrings worn in the 1992 movie "The Bodyguard" for $2,880 (estimate $600-800) and $7,040 (estimate $1,000-2,000). The Houston effects were on offer on the first of a two-day "Hollywood Legends" sale at Julien's Auctions in Beverly Hills -- just down the road from where the singer died on February 11. A stage-worn beaded bustier went under the hammer for $19,200, more than three times its estimate of $4,000-6,000, while a brown satin vest from "The Bodyguard" sold for $3,520, (reserve price $400-600). A small wardrobe's worth of dresses were pounced on by eager buyers, including one gray velvet gown which sold for $11,520, against an estimate of only $1,000-2,000. Houston died in her hotel room bathroom on the eve of the music industry's annual Grammys show in Los Angeles. Coroners said on March 22 that she had died of drowning, with heart disease and cocaine use as contributing factors. Other items sold at the two-day sale included a Christopher Reeve costume from "Superman IV: The Quest for Peace," estimated at $20-30,000, which went for $35,200.